What do babies, unisex bathrooms, and sausage egg casserole all have in common? They all have to do with the Display Advertising strategies of the four businesses featured in today’s blog post. Today, we’ll be looking at how some of the “Big-box” retail and grocery stores use Display Advertising to drive more foot traffic and online sales. These are stores like Walmart, Target, Sam’s Club or Whole Foods. Most people know that Big-box stores spend big through your traditional advertising channels — billboards, TV, radio print advertising, etc. Yet, how are these massive businesses spending on Display? Are they even spending on Display? Over the past 6 months, Target has spent an estimated $7,853,056 on Display. Nearly 2/3 of their ad spend has been allocated to Direct Buys. You’ll see that many Big-box stores prefer Direct Buys. This could be because Direct Buys on large sites often lead to a more consistent flow of traffic. This is great for big companies who focus on branding. Direct Buys will often allow them to get their ads in front of as many eyeballs as possible. Back in 2012, Target came under fire after Forbes published an article titled, “How Target Figured Out A Teen Girl Was Pregnant Before Her Father Did.” The article tells how Target sent coupons for baby products to a young girl’s house based on her consumption patterns at Target. Low and behold… she was pregnant! However, her father did not know until he saw all of these Target coupons for baby products in the mail. 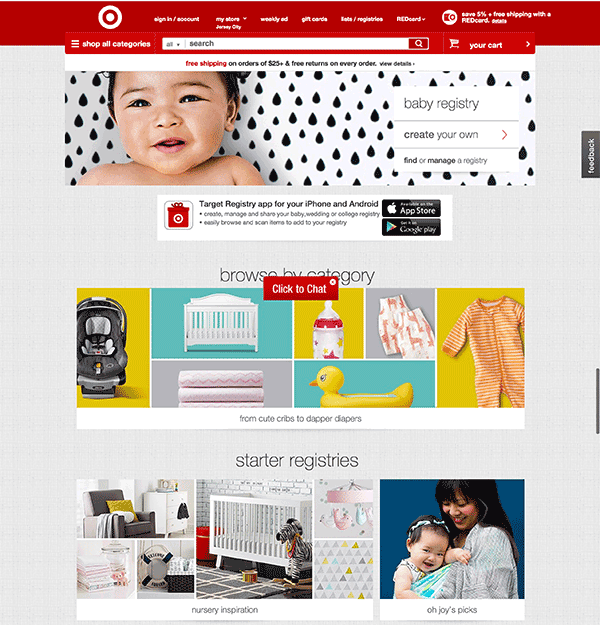 You’ll notice below that Target’s most seen ads are related to baby products and baby registries. It appears that Target plans their ad creatives strategy around certain time periods. This specific time period being when many women are pregnant. 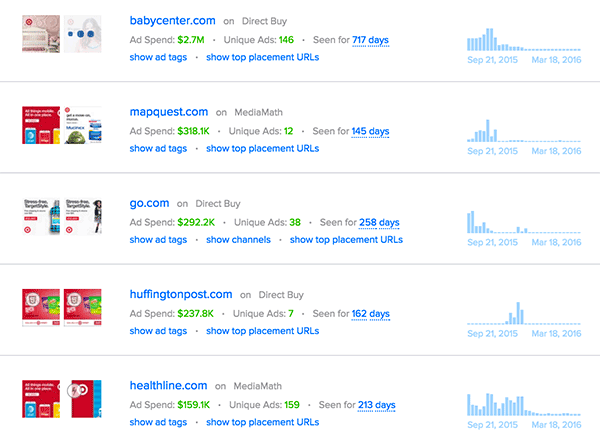 In line with what we looked at in the Top Ads section, Target.com purchased the most traffic directly from babycenter.com. Target’s landing pages are directly tied to the product being shown in the ad. Walmart has spent an estimated $3,608,064 on Display over the past six months. Walmart allocates the majority of their ad spend to the Google Display Network. Walmart also buys significant inventory through Direct Buys. They are also one of the few Big-box stores testing out Native Ads on Outbrain. Walmart’s ad creatives all focus on specific products or promotions. 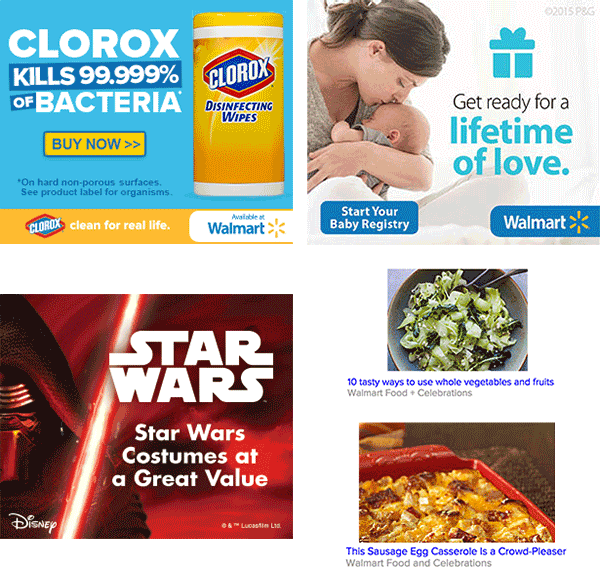 Their Native Ad creatives (shown in the lower right of the graphic below) send traffic to articles with recipes and cooking techniques. 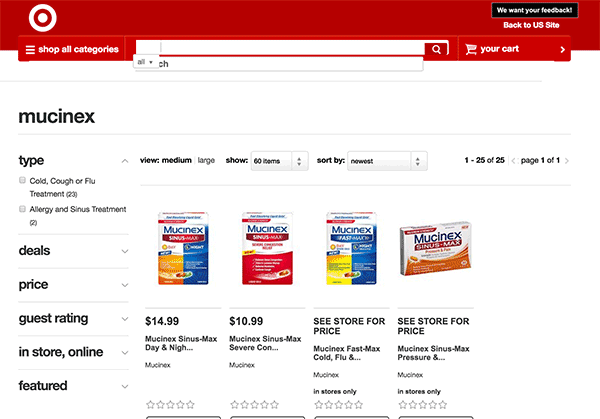 Like Target, Walmart also buys a large amount of inventory directly on babycenter.com. 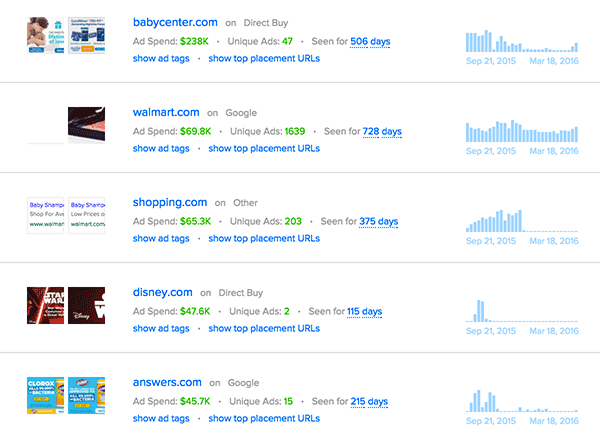 Walmart’s most seen ad creatives send traffic to landing pages related to the product advertised in the ad. There are two examples in the graphic below. The first landing page promotes their selection of Star Wars products. The second page promotes Pampers and other baby products. You also saw that Walmart is testing ads on Outbrain. Kroger is a North American supermarket chain founded in 1883, and is currently the largest supermarket chain by revenue. 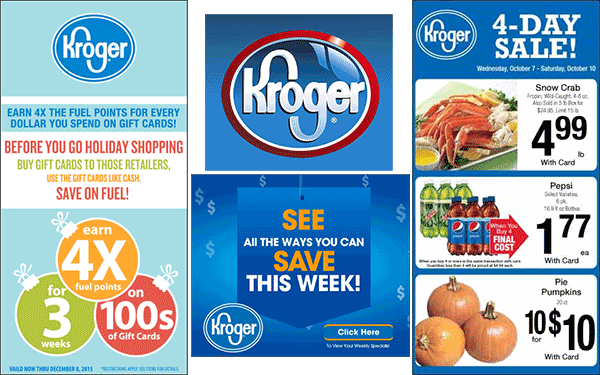 Despite being one of the larger chains, Kroger does not allocate much of their marketing budget to Display advertising. Kroger mainly uses branding style ads. And unlike the other stores in this post, they don’t advertise specific products unless the product is part of a short-term sale. In fact, some of their ads are quite plain. One ad creative is simply their logo. 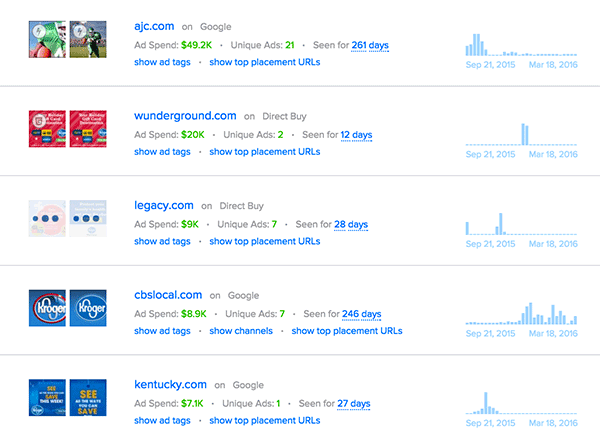 Kroger buys traffic on news sites, news station affiliates, and general interest sites like wunderground.com (a weather site). Kroger is split testing three different landing pages. 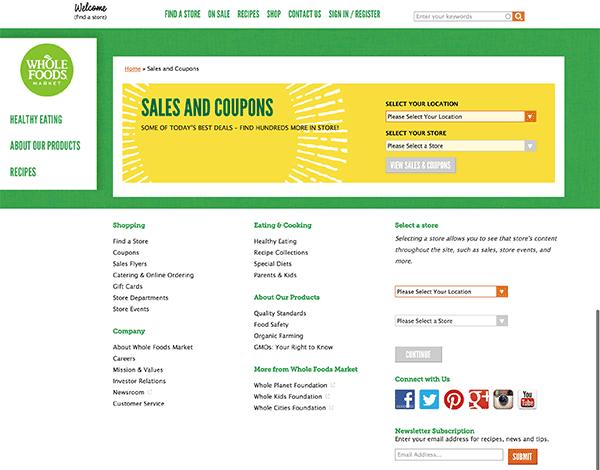 The first landing page (on the left) is a store locator. The second landing page (middle) is simply their homepage. The third landing page (right) promotes their gift cards. Meijer is a smaller chain of Big-box stores located in the midwest of the United States. 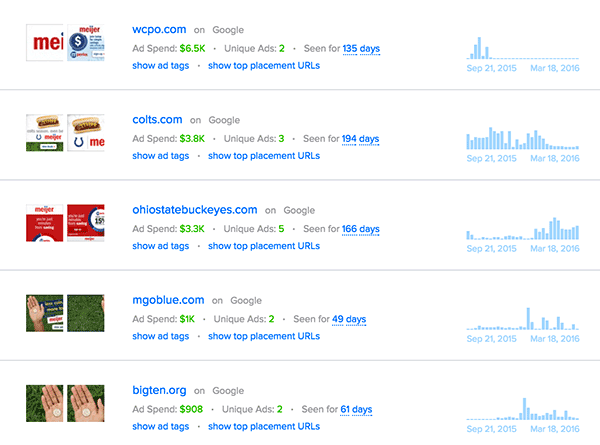 Meijer is the lowest spending advertiser featured in this blog post. They’ve spent an estimated $19,596 over the past 6 months. Meijer’s ad creatives all focus on saving money and signing up for their coupons/rewards program. Meijer buys traffic on local news affiliates sites, websites for specific sports teams, and other sports related sites. Given their publisher selection and their ad creative content, it appears that Meijer is using Display to target a male audience. 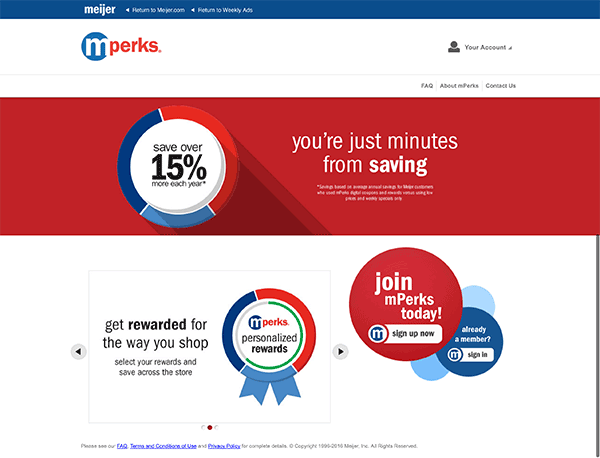 Meijer is split testing two different landing pages. When most Americans think of “healthy food,” they think of Whole Foods. Whole Foods is a large supermarket chain that sells food and products that are free of chemicals, preservatives, and artificial ingredients. Whole Foods has spent an estimated $1,180,928 over the past 6 months. They allocate most of their ad spend to the Google Display Network. 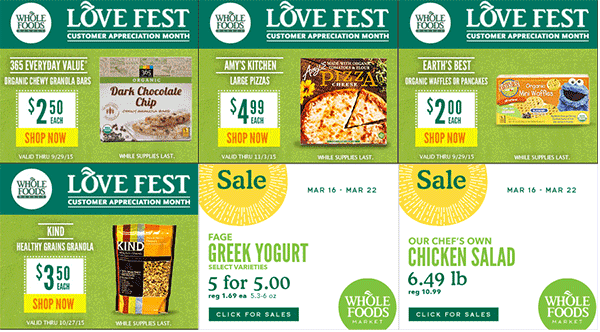 Whole Foods’ ad creative strategy centers around their different sales and promotions. 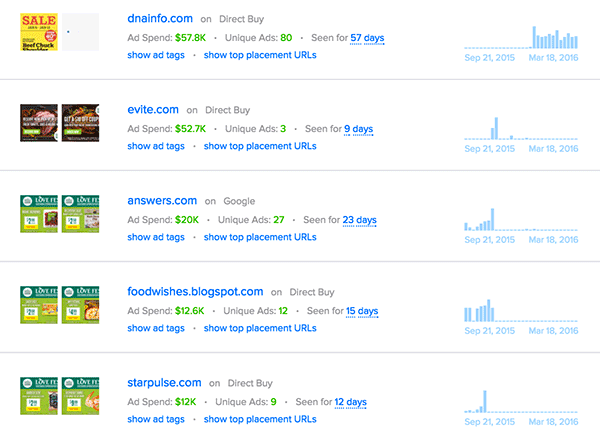 Whole Foods has spent significantly on dnainfo.com, a blog for large cities like New York and Chicago. The main strategy for most of these big-box stores centers around the Google Display Network and Direct Buys. Many Display advertisers tend to forget that Direct Buys can be an amazing source of traffic. However, it takes a little bit of effort to contact, negotiate and set-up the Direct Buy. This causes many advertisers to shy away from testing them. Take a page from the playbook of big-box stores and try out some Direct Buys out in your own campaigns. It looks like everyone in this study spent the majority of their tracked spend in Q4, and then dropped off hard in Q1. Most of the products/campaigns appear to be evergreen and not related to Fall or Holiday promotions/sales/branding so I don’t see an immediate reason for this shift (except the one Kroger ad). Is large spending in Q4 and then dropping off in Q1 in-line with what you’re seeing for YoY behavior? Is more is being allocated to Display for Q4 vs Q1 because overall shopping intent in Q4 is generally higher? Could these businesses be finding out their display ads didn’t provide enough value and get budgets slashed or shifted?